First Line: On the Westgate Bridge, behind them a flat in Altona, a dead woman, a girl really, dirty hair, dyed red, pale roots, she was stabbed too many times to count, stomach, chest, back, face. Inspector Stephen Villani, head of homicide in Melbourne, Australia, feels as though he's in charge of keeping all those plates spinning in the air at the carnival, but there are too many, and some of them are beginning to wobble. A dead woman in a penthouse apartment. A failed marriage. Three men butchered in a rampage. A teenage daughter determined to run completely off the rails. And the shady world of political ambiguity. Somehow, some way, Villani has navigate through a maze of inept police bureaucrats while maintaining an "all's well" facade to the press. It's the furthest thing from easy. His family, his workload, and his own past are conspiring to break him. If you're the type of reader who prefers to have at least one likable character in the fiction you read, Truth may not be for you. There's not one single person I cared for in this book. If you're the type of reader who prefers a linear plot that moves straight and true from Point A to Point B, Truth may not be for you. Main character Stephen Villani has a tendency to wander back and forth between the present and various chapters in his past. If you're the type of reader who doesn't care for short, sharp sentences, or ones that look a lot like lists, Truth may not be for you. 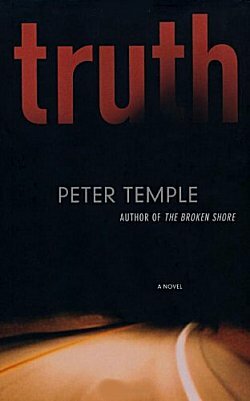 Peter Temple's writing style reminded me of another favorite author's-- Ken Bruen. And lastly, if you're the type of reader who is deeply offended at the liberal use of a four-letter obscenity that begins with "c," you should probably give Truth a miss. It's there, and in quantities that could easily put some readers off. I know I tired of it and wished that some of the characters would turn to the D's in their dictionaries. Now that I've listed all the reasons why you shouldn't read Truth, let me tell you why I kept on reading from first page to last and wound up giving it a high rating: Peter Temple's story grabbed me by the throat and wouldn't let go. "From the time the trees were head high, every time he walked the forest he heard new bird calls, saw new ground covers spreading, new plants sprung up, new droppings of different sizes and shapes, new burrowings, scrapings, scratchings, new holes, fallen feathers, drab ones and feathers that flashed sapphire, scarlet, blue, emerald, and soon there were tiny bones and spike-toothed skulls, signs of life and death and struggle among the arboreal mammals." The forest represents all the promise of Villani's youth, all the goodness that his life can contain. When new to the force, he was trained by the legendary Singo, a police officer with the sensibilities of the USA's Harry Bosch. Everyone counts, or no one counts. Do the job right regardless what the brass tells you. But Villani's life is under serious threat-- just like the wildfires that are threatening his beloved forest. It is our job as readers to see the deadfall begin to accumulate, to watch as each fallen limb, each bit of dead brush, slowly chokes the goodness from this man's life and makes it ready for the flames. We can see how each decision he made slowly transformed him into a man we don't like very much. The mystery's gripping, too, but for me this book is mainly a riveting character study of a man I'll not soon forget. Villani believes himself to be a blurred copy of all the important men in his life with their worst bits magnified. Is Stephen Villani beyond redemption? That's for you to discover for yourselves-- and I hope you do. I think Peter Temple is one of the most talented Australian authors out there, Cathy. And this one is really gut-level and beautifully done. Not surprised it won the Miles Franklin Award! Neither am I. This isn't the only Temple book I've read, and I agree that he is extremely talented.